High intensity interval training (HIIT) uses short bursts of intense exercise to achieve better fitness and athletic performance. HIIT workouts can be very effective for all age groups and ability levels. For beginners, the best starting point is to use less intense intervals. 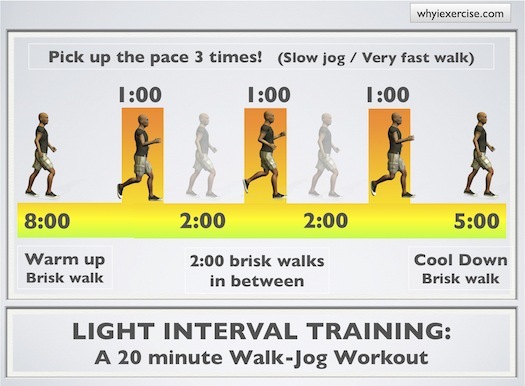 For example, 3 brief jogs can be mixed into a 20 minute brisk walk, as in the example below. You can use this interval training technique with all kinds of exercises. Pick up the pace for 1 minute as you ride a bike or climb stairs, increase the intensity on the elliptical trainer or stairclimber at the gym, or find a walking route with hills. Find more exercise ideas in the article on metabolic equivalent. Note: It is important to pace yourself with high intensity interval training. Know your limits. Try increasing to a vigorous (but not hard) effort at first. If you are a beginner, give your body at least 3-4 weeks to adapt to the new exercise before you try for a harder effort. Check with your health care provider before trying intense exercise, especially if you have been inactive for a long time. 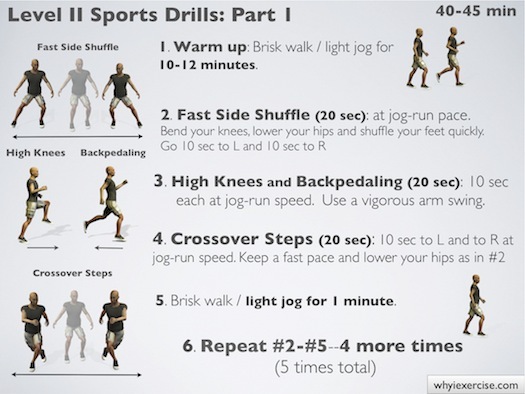 Sports drills can be very beneficial for beginners. This type of workout trains multiple muscle groups at the same time and also improves balance and agility. Are you ready for a high intensity workout? Determine your fitness level with the Cooper Test. 1. Find a flat, open space outside or in a gym to do these exercises. 2. Pace yourself during the intervals--Work vigorously, but don't reach the point of being out of breath. 3. Start with a small step size and stay on the balls of your feet for all 4 exercises. 4. Side shuffle--the further you lower your hips and bend your knees, the harder this exercise becomes. 5. High knees--Use a vigorous arm swing and stay on your toes. 6. Backpedaling--make sure you have a clear path behind you. *The workouts below are for more experienced exercisers. If you are following our free workout plans try these workouts during weeks 10-12. This type of workout (above) can also be used for walking hills, swimming, or cardio equipment like the elliptical trainer or stairclimber. 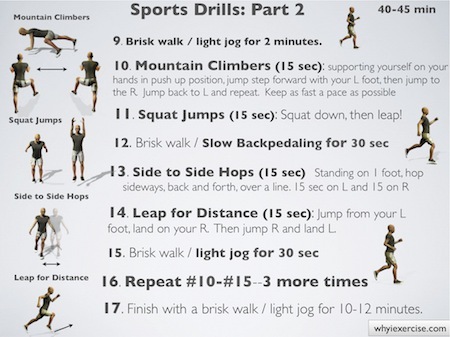 The workout below is designed from the base movements in sports such as basketball, volleyball, tennis and football. 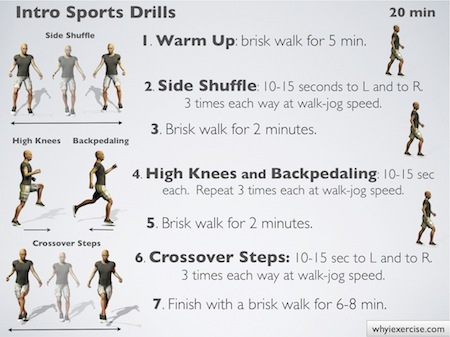 These exercise drills are helpful for building strength and balance for those types of sports. 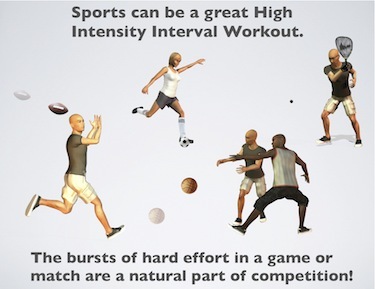 Playing sports with competitive bursts of energy can be part of your high intensity interval training. Just as with the more structured workouts, the effort you put into the exercise is the key to how much you get out of the workout. When playing sports, be conscious of your level of effort, and pace yourself so you can enjoy the entire game or match and get a good workout at the same time. 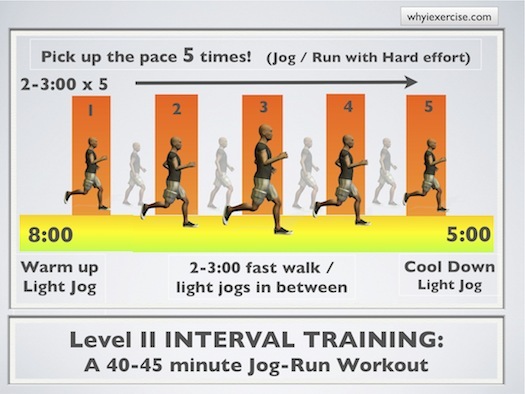 Return from high intensity interval training to free home exercise programs. Return from high intensity interval training to 'why I exercise'.